This large shrub is finally starting to receive the recognition it deserves. A native of China, seven-son-flower was first collected in 1907, named in 1916, and then languished in obscurity. Another expedition to China in 1980 resulted in a collection of viable seeds that were propagated and distributed to several botanical institutions and nurseries. Over the years, it has slowly become more widely planted. Numerous characteristics contribute to the attractiveness of this plant. Leaves are a dark, glossy green and are rarely bothered by pests. Creamy, white flowers appear in late summer when few plants are in bloom. 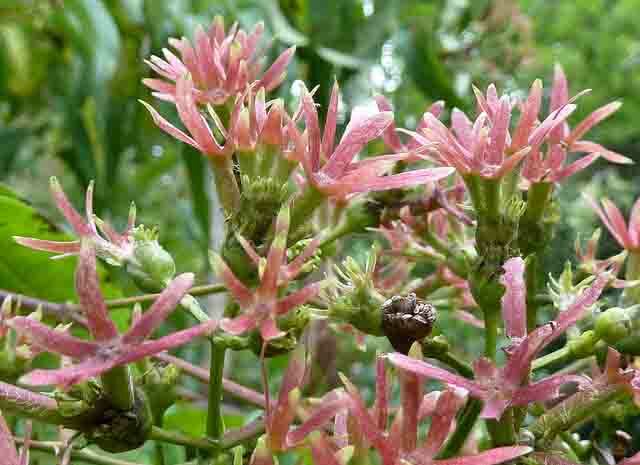 The inflorescence is distinctive in arrangement and effect. Though each individual flower is quite small, they are borne in a panicle with six flowers tiered in a whorl with the seventh terminating the inflorescence. Panicles are born on the tips of branches. After the flowers fade, fruit appears with surrounding sepals. Color changes from green to red and persists for 2 to 3 weeks. This plant is actually more attractive in this post-bloom period than in flower.